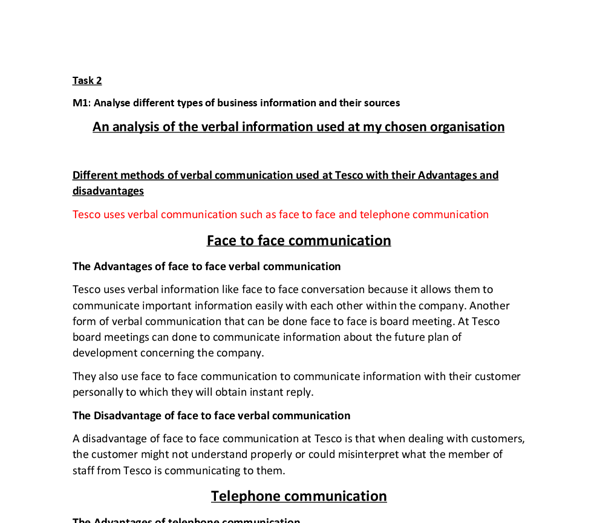 ﻿Task 2 M1: Analyse different types of business information and their sources An analysis of the verbal information used at my chosen organisation Different methods of verbal communication used at Tesco with their Advantages and disadvantages Tesco uses verbal communication such as face to face and telephone communication Face to face communication The Advantages of face to face verbal communication Tesco uses verbal information like face to face conversation because it allows them to communicate important information easily with each other within the company. Another form of verbal communication that can be done face to face is board meeting. At Tesco board meetings can done to communicate information about the future plan of development concerning the company. They also use face to face communication to communicate information with their customer personally to which they will obtain instant reply. The Disadvantage of face to face verbal communication A disadvantage of face to face communication at Tesco is that when dealing with customers, the customer might not understand properly or could misinterpret what the member of staff from Tesco is communicating to them. Telephone communication The Advantages of telephone communication Tesco use telephone communication and the advantage of this is they will have a quick reply and speak to the person they wanted to. ...read more. An advantage of using letters is that they can easily reach and communicate with their customers about financial issues or bills. Disadvantage A disadvantage of using letter is that the letter might not get delivered to the specific place you want it or on time, this could cause problems. Another disadvantage of using a letter is that it might get lost in the post and never get in to the destination. 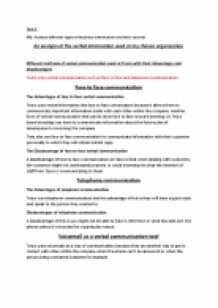 Memorandums Memorandums are not used for written communication by Tesco Reports Advantage Tesco use reports as a form of written information to communicate with between staff members within the company. The advantage of them using reports is that they record and show information of what happened during an entire week or month in a store for example. A report often contains information, sales figures and bar graphs to show the overall performance of something. Tesco use report to convey information about how they performed annually every year to show people their profit/sales etc. Disadvantage A disadvantage of using reports is that writing involves gathering a lot of data sometimes and they are quite time consuming. It would take a lot of time to produce reports because you have to record every that has occurred and sometimes doesn?t provide the full information it is hard to acquire all information and note them down. ...read more. because they will know which promotion strategy will be best to make more sales the ? ?store offers?? or ? ?buy one get one free?? Disadvantage: The disadvantage of marketing is Tesco has to go through a long process before they develop an effective marketing strategy Purchasing Advantage Purchasing is used by Tesco. This is an advantage when the customer purchases a product and if it?s out of stock the system of Tesco will order more stock automatically from the manufacturers Disadvantage The disadvantage of purchasing is that it is very difficult to keep up to date with suppliers cost change if the system is set up for automatic orders Sales Advantage A sale is when something is acquired for money for example product/sales. The advantage of sales is that it is easy to track and monitor Disadvantage The disadvantage of sale is not everyone is allowed to see it only the specific person is allowed to see it Manufacturing Manufacturing is when an organisation produce large quantities of a product for a business that requires it. The advantage is they can supply as much as the business require Disadvantage: The disadvantage of this is not everyone can see the information but specific staff Administration Advantage The advantage of Tesco using administration is they can contact anybody in Tesco ...read more. Currently 22 per cent of Tesco's sales and profits in the UK come from Non-Food and whilst only owning about 7% of the market share can still generate 6 billion in profits in the UK alone. This clearly shows how successful Tesco have been in trying to meet their aim. It talks about the share price. This graph has being displayed in a complex form and can only be analysed by a business based person because it shows the fluctuation of the company's share price. The target audience of such information would be a business based person because of the format it is being laid out as in a graph. This is even more so important when the business does not have any staff members with accountancy skills. Having an accountant on hand is very beneficial as it saves a lot of time meaning that as a business owner, I can focus more on ensuring the business succeeds rather than spending hours poring over financial documents. information, presentations also are time costly which can have an impact on expenditure because Tesco PLC would have to pay the employees for the time they waste on presentations Is videoconferences used: Videoconferences are used in Tesco PLC, they are used to contact different managers in their different bases in the different countries.